One of the most interesting stops for visitors to Jerusalem gliding through centuries of history on the city’s sleek and modern light rail system is the Mahaneh Yehudah open-air market, bustling with vendors during the day and packed with restaurant and bar patrons at night. Now towering over this lively scene is one of the city’s newest and most impressive buildings, home to the Windows of Jerusalem luxury apartment hotel/vacation rental complex. Windows of Jerusalem is the brainchild of American-born businessman Andy Altschuler, who launched the ambitious project in 2011 with five apartments, It has since grown to encompass 25 fully furnished short-term rental apartments, ranging in size from one to four bedrooms, with the larger units sleeping up to 10 guests, plus an option to accommodate up to 13. 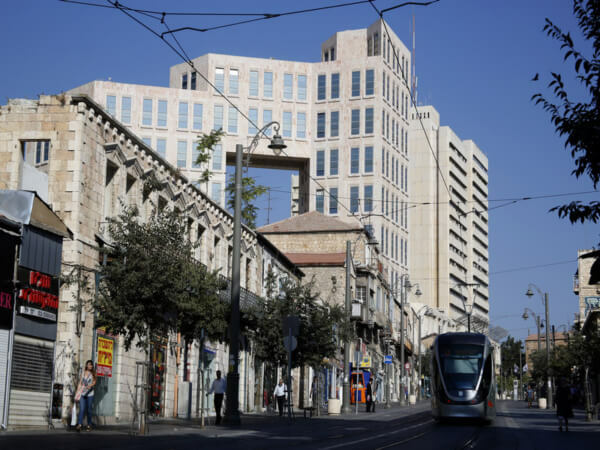 The striking edifice that houses Windows of Jerusalem — already a landmark, thanks to the distinctive square “window” that demarcates its two wings — is only eight years old, so all the apartments are new and modern. They are also equipped with just about every convenience one can want. Kitchens come with wide-body refrigerators, built-in stoves and ovens, dishwashers, microwaves, electric kettles, toasters and espresso machines. The kitchen cupboards and drawers are stocked with dishes, pots and pans, cutlery, utensils, cups and glasses. There are even Britta water filter pitchers inside the refrigerators. Living rooms contain entertainment systems featuring 40-55″ flat screen plasma TVs, DVD players, and individual routers providing free wi-fi. Windows of Jerusalem has its own satellite array streaming more than 100 channels, although the only ones broadcasting in English are international news channels. There are no television sets in any bedrooms. One amenity in particular that most travelers appreciate — especially those staying a week, which is the average Windows of Jerusalem stay — are the washers and dryers in every apartment, complete with detergent. Not to mention bathtubs in which weary tourists may soak. When exiting the shower or bath, a pleasant surprise awaits: guests are allotted no fewer than three different-sized towels apiece, including a bath towel as large as a sheet! Still, the biggest draw here continues to be the spectacular views: of the new city, the Old City, the Mount of Olives and Mt. Scopus, and extending across the international border to take in the hills of Moab in present-day Jordan. Many apartments boast floor-to-ceiling windows, while the remaining ones have windows that extend from the ceiling halfway to the floor. Seven apartments feature balconies, one even a huge wraparound veranda. The downtown location is also hard to beat, in walking distance to most sightseeing attractions and adjacent to a hub of public transportation. Therefore, and because parking is a bit inconvenient and expensive, it is not recommended to check in with a car. Windows of Jerusalem management can help book tours within and even outside the city. According to Altschuler, Windows of Jerusalem has more top-rated reviews on social media than any other Jerusalem vacation rental property, at prices that are lower than any hotel in the city. Rates vary not only by size of apartment but also in accordance with four different periods of the year: off-season, shoulder season, high season and Jewish/Christian holidays. 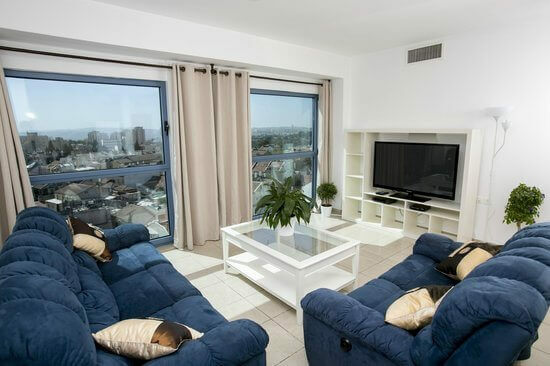 Published rates: $79 (1-bedroom, low season) to $1500 per night (4-bedroom, holiday) per apartment. A one-time cleaning and set-up fee of $99-179 is assessed regardless of length of stay. A security deposit of $1,000.00 is required. You can also book through a 3rd party booking site such as Travelocity or Expedia. Text by Buzzy Gordon, who was a guest of Windows of Jerusalem for purposes of review. Photos courtesy of Windows of Jerusalem.